AbigailNatenshon.com - Are You Seeking Treatment? Are You Seeking Treatment Services? Are you wondering if certain eating habits and/or body image concerns could mark the onset of a clinical eating disorder? · Does it frighten you to think that an eating disorder might be fatal? · Are you of the (erroneous) belief that an eating disorder is incurable? · If you are currently in treatment, do you feel discouraged that your progress is not what it should be? · Finally, as a patient, do you find yourself at a loss for where to turn to find the quality of expert help you and/or your child deserve? If so, you have come to the right place…. It may surprise you to know that when treatment is responsive to the unique demands of these disorders and requirements for care, successful outcomes are clearly within reach in 80% of cases. During the 41 years of my psychotherapy practice, I have brought many hundreds of hard-to-treat eating disorder patients to complete recovery, mentoring and motivating them to learn to discover more effective means for managing and resolving life's problems. In choosing a therapist, you require, and deserve, a clear picture of that professional's treatment qualifications and capacity for empathy and therapeutic connection. I invite you to contact me (847-432-1795) to discuss how I work, my philosophy of treatment, and any concerns and questions you might have about yourself, eating disorders, and/or the treatment and recovery processes. It takes courage to pick up the phone to make this first leap of faith towards healing. Even as early as this very first encounter, you should be able to discern the quality of a therapist's knowledge and caring. If you are currently engaged in treatment that has not been effective, your next effort needs to be different. It is time to do "what works," to secure treatment that is change-focused and outcome-driven, to rest assured that you have found an advocate and mentor fully capable and committed to walking this path together with you. 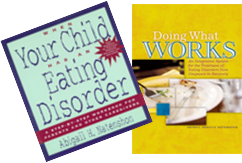 You are invited to seek additional support, as well, in browsing my website, www.empoweredparents.com and in reading my book "When Your Child Has an Eating Disorder: a Step-by-Step Workbook for Parents and Other Caregivers." Both resources will educate and prepare you to meet the challenges and rewards that lie ahead for you. 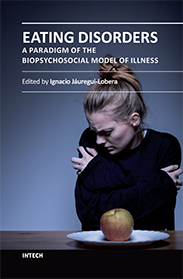 This workbook will provide an invaluable resource in describing what these disorders are really about, what makes ED treatment effective, and how a patient can insure recovery. Abigail Natenshon is the founder and director of Eating Disorder Specialists of Illinois: a Clinic without Walls. Natenshon is a preferred, out-of-network provider for most insurance companies; she is available to provide treatment seven days and evenings a week. (click here for more information). · Individual psychotherapy treatment for children, teens and adults, as well as family therapy to enhance the individual patient’s recovery outcomes. · Eating disorder group therapy is available to individuals seeking the integrative, experiential mind/body work of Anat Baniel Method© / Feldenkrais Method©. This form of somatic education, when used as adjunct treatment in combination with more traditional approaches, by providing integrative movement with attention, enables autonomous shifting out of old habits and into useful new ones. It facilitates learning “from the inside out;” enhancing sensory-awareness and re-integrating neurological function that goes far to re-create a core sense of self. (Read Abbie’s article about The Feldenkrais Method © and Anat Baniel Method © in the Treatment of Eating Disorders, published in the Feldenkrais Educational Foundation of North America SenseAbility Newsletter. (Click here for more information) . · Intensive short-term “marathon” treatment for out-of-towners, upgrading recovery status, rectifying action plans, providing education, strategies, and motivation to heal. · Online webinars and educative support groups, as well as On-site support groups for parents and families.